In less than one hour NASA will be holding a press conference to announce “new discoveries” made by the Kepler spacecraft. It’s highly likely that they will announce the discovery of new planets and that these are very similar to earth. The Kepler has been actively looking for new worlds since 2009. The mission was created to survey a specific portion of our Milky Way galaxy and to discover Earth-size planets in zones that would be able to accommodate life. These are the objectives of the Kepler mission. This is exciting news and we will update as soon as we know more. 17:01 Darrell here, just waiting for the stream to start. 17.03 Started. waiting while they introduce people. 17:07 Currently discussing how Kepler discovers planets around distant stars. 17:12 Jon Jenkins, Kepler data analysis lead at NASA’s Ames Research Center in Moffett Field, California is now talking. 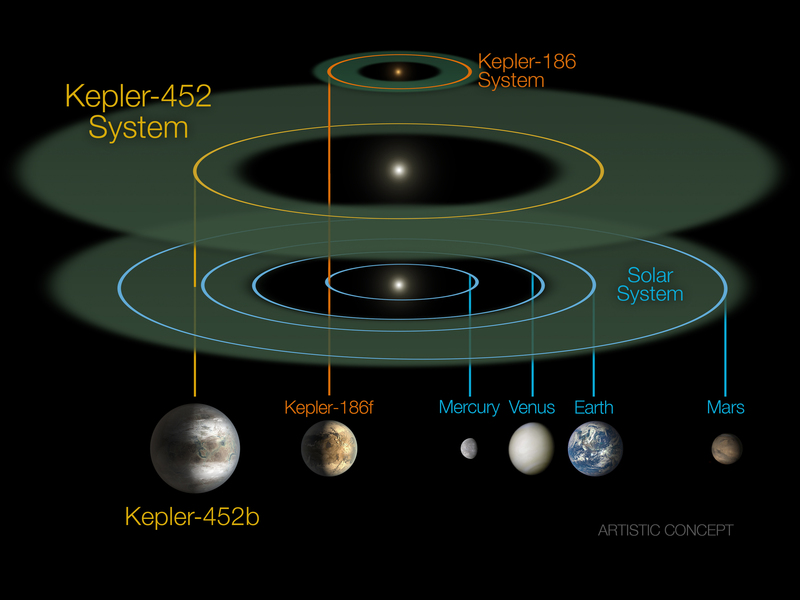 17:17 Kepler-452b has been in the habitable zone of it’s star longer than Earth, so has a good chance of having had life evolve. 17:20 The stream has gone “Off Air” possibly due to overloaded servers, or maybe our new alien overlords are trying to stop the news getting out. 17:23 It’s back. Not sure what we missed, the stream will be available afterwards as a recording. 17:24 Talking about how they scour the data for exoplanets. They use software to speed up the process. 17:25 They are still expecting to find more earth sized planets in G star habitable zones as the software improves. 17:30 Size comparison of the first extra solar planet discovered and todays announcement. 20 Years of progress. 17:30 Talking about the future, having found this earth like planet and expecting others to come, how future missions can focus on them for further study. 17:32 First Question from Wired about how they came to design the image used for the planet. Basically it’s a guess based to it’s size and location. similar question now being asked about how they know how old the planet is. Again its a guess based on how old the star is. 17:37 Question about the gravity, supposedly twice that of Earth, we can probably survive that and would adapt over time. 17:40 Reporter from USA Today is a moron, either that or hasn’t been listening. 17:41 Distance of the star from us 1400 Light years, so it’s a long journey. 17:43 Reuters reporter missed her slot to ask a question. 17:45 Earth planets more common that Jupiters and sun like stars make up 15-20% of stars in our galaxy. 17:46 Talking about the K2 mission and how it will continue the search for Exoplanets. 17:47 Reuters is back. 452b is (as far as they know) the only planet they have seen in this system, but they are following up . There are another 7 possible candidates of earth sized planets around sun like stars, they are still studying the data and will do for years if not decades. 17:55 Question from the Times. How long till we can get there. Impossible question to answer. Maybe if Rupert Murdoch spent his millions on space exploration we could get there sooner. 18:02 Question about the math, how much uncertainty is there in the figures. Planet has been confirmed to 99.76% certainty but the mass has only been confirmed to within plus or minus 2 Earth masses. 18:07 Questions seem to be getting sillier. Asking about life on other planets now, this isn’t what Kepler is about. 18:10 Talking about the James Webb telescope that might be able to tell us more about 452b’s atmosphere. We’ll post a link to the recording of this session as soon as we have it, so any latecomers can listen to the whole thing. Thanks for the tip Charlie Miskelly. Crikey Mr. Hatti, you seem to have beaten NASA to publishing it first! Great news nonetheless, hope this one has the similar (if not same) atmospheric size, composition and gravity to Earth. Really looking forward to the press conference now, thanks for the heads up.